The Opposition has decided on their shadow cabinet portfolios. Twenty one MPs of the Social Democratic Liberal Party have been assigned to the various ministries. Sitiveni Rabuka – Opposition spokesperson on the Economy, Public Enterprises and Public Service. 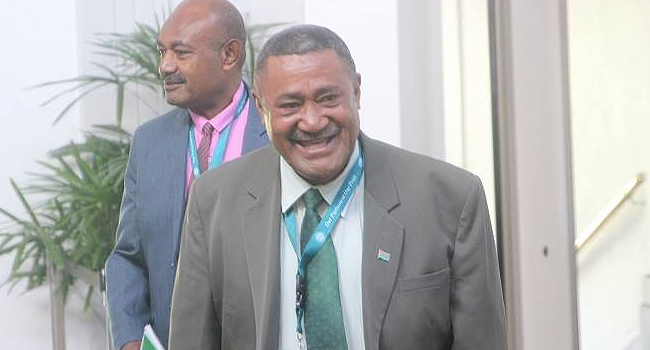 Ratu Naiqama Lalabalavu – Opposition spokesperson on iTaukei Affairs. Ro Teimumu Kepa – Opposition spokesperson on Education. Anare Jale – Opposition spokesperson on Foreign Affairs. Adi Litia Qionibaravi – Opposition spokesperson on Ministry of Justice, Information and Communications. Assistant spokesperson on iTaukei Affairs. Viliame Gavoka – Opposition spokesperson on Tourism and Civil Aviation. Niko Naiwaikula – Opposition spokesperson on Ministry of the Attorney General. Ratu Suliano Matanitobua – Opposition spokesperson on Youth and Sports. Salote Radrodro – Opposition spokesperson on Women, Children, Social Welfare and Poverty Alleviation and PSC. Mikaele Leawere – Opposition spokesperson on Labour, Employment Relations and Productivity. Assistant Opposition Spokesperson on Education. Aseri Radrodro – Opposition spokesperson on Infrastructure, Transport and Utilities. Mosese Bulitavu – Opposition spokesperson on Defence and Immigration. Mitieli Bulanauca – Opposition spokesperson on Land and Mineral Resources. Jese Saukuru – Opposition spokesperson on regional Development and Disaster Management. Lynda Tabuya – Opposition spokesperson on Local Government, Housing and Environment. Assistant Opposition spokesperson on Ministry of Attorney General. Assistant Opposition spokesperson on Labour, Employment Relations and Productivity. Ro Filipe Tuisawau – Opposition spokesperson on Industry, Trade, Commerce. Inosi Kuridrani – Opposition spokesperson on Agriculture and Sugar. Simione Rasova – Opposition spokesperson on Fisheries. Assistant Opposition spokesperson on Youth and Sports. Peceli Vosanibola – Opposition spokesperson on Forests. Assistant Opposition spokesperson on Health. Ratu Atonio Lalabalavu – Opposition spokesperson on Health. Ratu Tevita Niumataiwalu – Assistant Opposition spokesperson on Defence and Immigration.